In an isolated olive grove on the idyllic Aegean island of Tinos, revered by religious pilgrims around the world as the Lourdes of Greece, two bodies charred beyond recognition are discovered, chained together amid bits and pieces of an incinerated Greek flag. An enraged press screams for justice for the unknown victims, until the dead are identified as gypsies, after which the story simply fades away. However, Inspector Andreas Kaldis, feared head of Greece's special crimes division, has other plans. 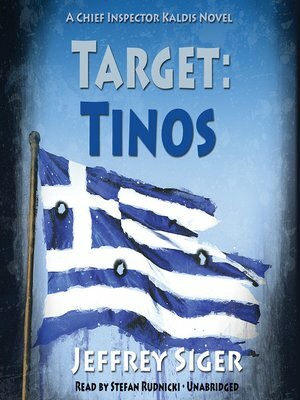 He presses on in his inimitable, impolitic style to unravel a mystery that reveals even more dead, uncovers a modern secret society rooted in two-hundred-year-old traditions, and spawns a nagging suspicion that the answers lie in the sudden influx of non-Greeks and gypsies to Tinos. It is there, on Tinos, that Kaldis learns of priceless hoards of gold, silver, art, and precious gems quietly amassed over centuries out of the offerings of grateful pilgrims. He has found a motive for murder and an irresistible temptation for robbery.